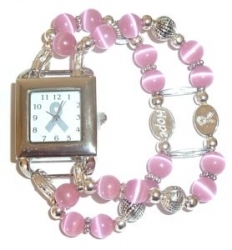 At Hidden Hollow Beads we offer a variety of beautiful, high quality, cancer awareness supplies for use in fundraising efforts, awareness events, pink out days, or just to wear to show your support for the fight against cancer. Here are a few of the beautiful products you’ll find on our site. 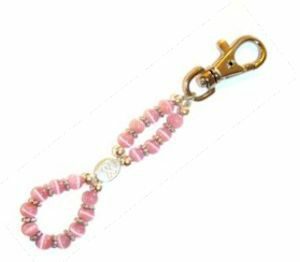 Breast Cancer Awareness Bracelet – 6mm cat’s eye beads. Our beautiful, hand crafted, cancer awareness bracelets are a lovely way to show support for those you love who are fighting cancer. They may cost a little more than a rubber wrist band, but they will stand the test of time. They can be worn dressed up or dressed down, you can’t do that with a rubber wrist band. You can use them for fundraising efforts, or give them as thank you gifts to your volunteers and community supporters after a fundraiser or cancer awareness event. 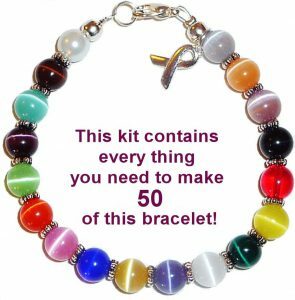 Cancer Awareness Bracelet Kit – Make your own cancer jewelry using this cancer awareness bracelet kit. 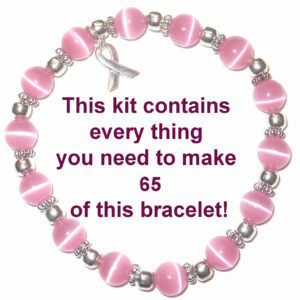 Kit contains everything you need to make 50 8mm cancer awareness bracelets. 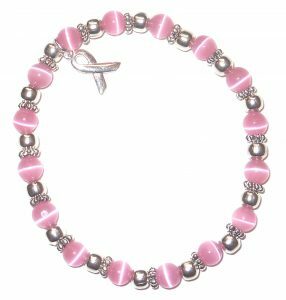 Breast Cancer Awareness Kits – Kit contains everything you need to make your own cancer awareness bracelets with 6mm pink cat’s eye beads. 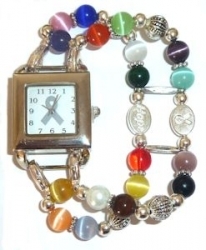 Make your own cancer awareness jewelry for higher profits. 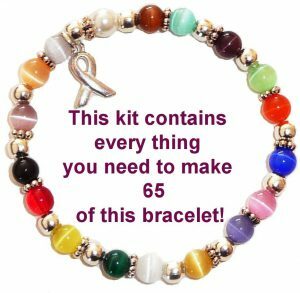 Cancer Awareness Bracelet Kit – Wholesale Cancer Awareness Products – This kit contains everything you need to make 65 bracelets with stretch cord in all the cancer colors. Lower cost means higher profits for your fundraising efforts. If you’re thinking of holding a cancer awareness fundraiser, you really can’t beat our cancer fundraising kits for value. The kits come with everything you need to make to either 50 or 65 bracelets, including a picture of the finished product and instructions to ensure that you’ll have a perfect bracelet every time. The wired kits come with strong seven strand beadalon wire and lobster clasps. The finished bracelets at 7 1/4″ long and will fit most adult wrists. They also come with expansion rings, to make them a little larger, should someone need them. There is no jewelry tool included in the kit, so you’ll want to purchase one, if you don’t have one already. The bracelets made with stretch cord are easy to put on and take off, which is an advantage for some people. They stretch to fit nearly everyone and are easy to make. The kit comes with just enough stretch cord to make the bracelets. If you think you might want a little extra cord to work with, we recommend purchasing an additional roll of stretch cord to give you peace of mind and allow for mistakes. Some people prefer an alternative to the traditional cancer awareness jewelry. 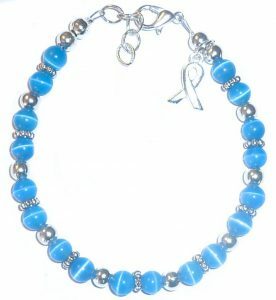 For them we offer cancer awareness watches, lanyards, key charms, necklaces, and bangle bracelets. 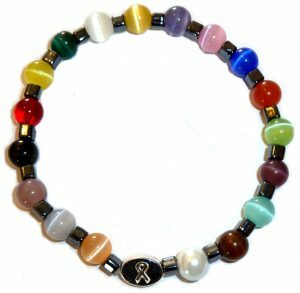 We also carry a wide variety of jewelry making supplies, for anyone who would like to turn their hand to creating their own cancer awareness supplies from their own design.